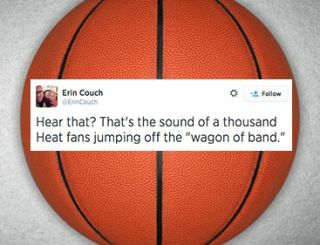 Twitter Round-Up: "That's the sound of a thousand Heat fans jumping off the 'wagon of band.'" Welcome back #AVTweeps! Now that the dust has settled from InfoComm 2014, we've slowly been digging ourselves out a pile of unanswered emails and, with help from Brock McGinnis (who's featured in this week's Twitter round-up), realizing the value of the show this year. Judging by the amazing positivity we saw on our Twitter timeline, it looks like InfoComm was good for business. From inspiring quotes and wise words to company outings, there was no shortage of encouraging Tweets this week — that is, unless you're a Heats fan (thanks, @ErinCouch).